Since college, I’ve been carving a path trying to get where God has wanted me to be. It’s been such a long journey and at so many moments I’ve stood looking ahead at all the sticks, weeds, and rocks with self-doubt, questioning God’s plan. I would be lying if I said my decision to move to Ann Arbor wasn’t one of those moments. This week however, God reassured me I’m right on track. Yesterday, I took a tour of C.S. Mott Children’s Hospital. 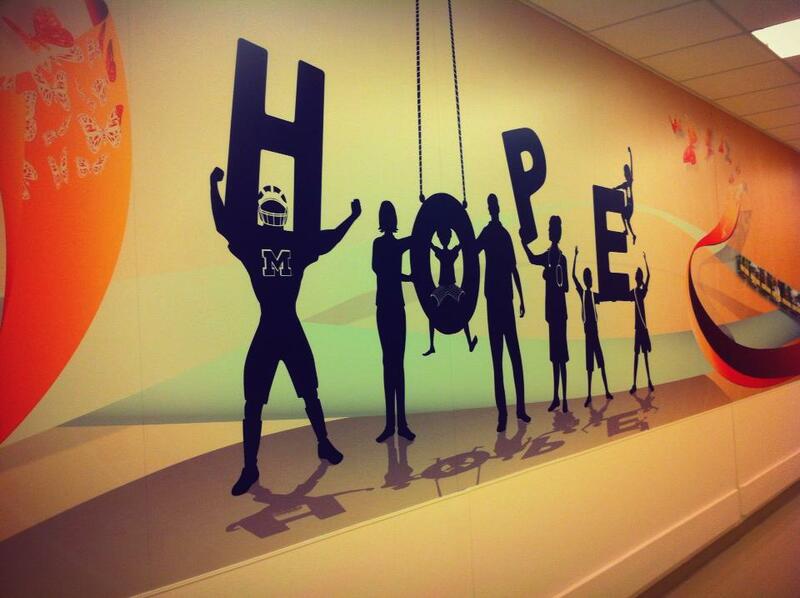 It was the first time since Myles’s passing that I stepped foot in a children’s hospital and it was a bit emotional. The man leading the tour, a co-worker named Mike, had a unique story. Mike’s son Eric, was treated at C.S. Mott and unfortunately passed away. However, throughout the tour, you could sense Mike’s sincere passion and dedication to this hospital. His emotions tugged at my heart, causing me to get teary-eyed as I remembered everyone we encounter has something they have to wake up and face each and every day. Throughout my morning spent in the children’s hospital, I watched numerous families pour into the hospital for appointments. I made eye-contact with many and their stress was easy to read. I instantly found myself empathetic and wanting to meet each of them, talk to them, and ask how I could help. With each family I observed, I mentally said a quick prayer. To no surprise the floor I found myself the most emotional on was the Pediatric Cancer Unit or the Carr Unit as it is known at C.S. Mott. After observing both of these, my curiosity grew and I began to focus on a long narrow hallway. I watched as a bright-eyed bald headed girl shuffled from one room with an IV pumping chemo. I grew teary and said a quick prayer as I watched her disappear down the hallway. Soon after, we visited a waiting room. I laid eyes on two grandparents wearing gold ribbons on their shirts (the color for pediatric cancer) and a mother holding her bald daughter who wore a headband with a large bow. She grinned at me and the grandpa said hello. Without knowing who I am, he pointed to my University of Michigan Health System ID badge and said thank you. I was speechless. He didn’t even know who I was or what I did. I nodded and said “You’re certainly welcome.” The rest of the tour had moved on and I wanted to sit there and talk to that man. I wanted to let him know I understood and wanted to ask what I could do. I may not remember that day, but I will never forget that moment. One of the last parts of the tour was visiting the wall of courage. On this wall were photos and short bios about cancer patients who had been treated at the C.S. Mott Children’s Hospital. There was one photo that stood out to me most: an infant decked out in Michigan attire. As I stared at that image I finally understood what it means to be a Wolverine. You see, since I’ve moved to Michigan, I felt like a band-wagon fan. But in that moment, I realized something much greater. Being a Wolverine isn’t just about being a student at the University of Michigan. Being Michigan Wolverine is about this intricate family who have been affected/touched by and are associated with this great University and all that it encompasses, especially with the medical system. I officially consider myself a part of that family. I am a Wolverine. Touring C.S. Mott Children’s Hospital reminded me of my purpose and as I visited each floor in amazement of the facilities, I knew this is where God wants me to be. I can’t wait to see what else He has in store for me. September is Childhood Cancer Awareness month. 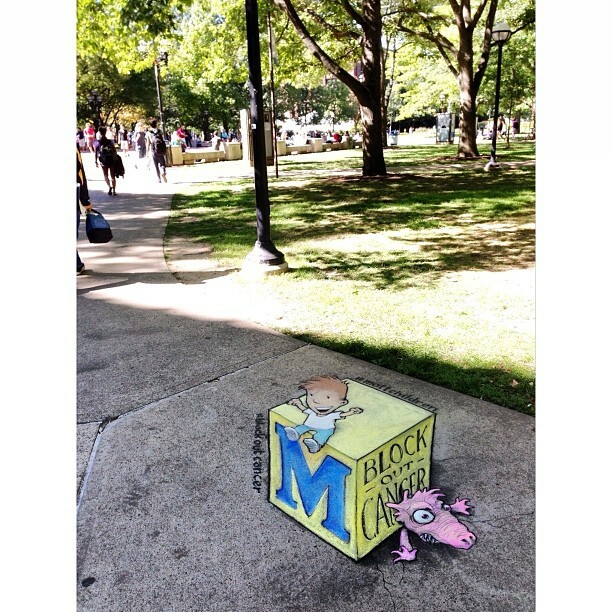 I must say, I am certainly proud to be apart of the University of Michigan Health System, especially after this video and all other Block Out Cancer initiatives they have made for the month of September. There are so many names that come to mind when I think about pediatric cancer — Myles, Brogan, Patrick, Maddie, Jake, Gavin. Because of each of them, my passion for playing a role in finding a cure for pediatric cancer has become more important to me than ever. Thus, I can’t imagine not spreading awareness on my blog. Today, 720 kids will be diagnosed with cancer. Every four hours a child loses their life to pediatric cancer. The average age children diagnosed with cancer is 10. According to the American Childhood Cancer Organization, that’s 67 years of life lost. To me, that’s not okay. Together we can BL(M)CK Out Cancer. Fall. I am so happy to see September finally here. This month brings football, changing leaves, cooler temperatures, and lots of pumpkin spice coffee! Yum! More importantly, September means the end of summer. This summer wasn’t quite what I expected. I spent most of it unemployed and confused. Even though this summer was rather dreadful, I can say I don’t have ill-feelings toward it. Through all the job applications, tears, self-pity, stress, doubt, and anger.. I was actually learning about myself. I haven’t been that emotionally and spiritually challenged in so long. I won’t bore you with all my personal lessons, but know that God has a reason for every situation we have to face. This summer was intense, but worth it. I feel like I am right where God wants me to be. It is so funny because we try and take matters into our own hands. I thought for sure that I’d end up working at Make-A-Wish here in Michigan. I wasn’t really even open to considering anywhere else. I think God laughed at me for this one. While I did enjoy my time spent at the Michigan chapter (I met so many awesome people), I quickly learned this wasn’t what God wanted for me here in Michigan. There are two things I prayed for when I got to Michigan: a church and a job. I asked God to put me where he wanted, not where I wanted to be. Even if that meant me having to move and Jaron and I do long distance. I applied for jobs all over the country this summer. For some reason, none of them worked out…even the one position I was a top candidate for in Pittsburgh. They took their offer off of the table because they blatantly told me they didn’t think it was where I belonged. Although it hurt my feelings at the time, now, looking back, that was God’s way of saying, “No Shae, not this one….” I was so frustrated and shaken to my core when this organization removed their offer..
About a month later, I finally understood. God provided me with an answer to my first prayer towards the middle of July. I finally found a home church in Ann Arbor. I fell in love with it. The people were amazing, the service was sincere, and it was smaller… absolutely everything I wanted. The same week I found this church and attended my first service, I got a call for a job interview at the University of Michigan for a job I really wanted. Within the month, I received a job offer for a mid-level position at UM which I now hold. GOD IS SO GOOD! Things aren’t perfect, but I truly believe I was put in Ann Arbor to walk a whole new path. I’m not sure what my new purpose is and I am struggling transitioning from college into the work force, but I have faith I’m headed in the right direction. I’m so happy and blessed to finally feel at home here in Ann Arbor. I’m ecstatic to be spending my first fall in Michigan (and at lots of UM games and tailgates)! Here’s to an awesome fall!